Here's a brief guide to the kinds of genealogy records you might be able to find relating to a person's death in the United States. Many states started recording and requiring death certificates in the early part of the 20th Century. Some states go back further. If you don't know where someone is buried, death certificates often list place of burial. Some cemeteries have placed their burial indexes online, while others have been transcribed by volunteers. Wills and probate records can be helpful as they usually list a person's heirs - their spouse or children, or sometimes siblings or other relatives. Some counties now have recent probate indexes online. Try the death indexes directory or do a Google search for the particular county you are interested in. Some older probate records and wills can be found on digitized microfilm from FamilySearch. You might also be able to find probate records in the courthouse where the will was probated or a local or state archive or other repository if the records were moved there. Ancestry has put some digitized images of World War II Draft Registration Cards online, and they are indexed by name (this database requires a fee-based subscription). These draft cards are from the Fourth Registration, which was conducted on 27 April 1942 - this is the only registration currently available to the public. This registration was for men born 28 April 1877 to 16 February 1897 (and not already in the military). It is sometimes referred to as "the old man's registration." These WWII draft cards are presently available online at Ancestry for the following states... Alaska, Arizona, Arkansas, California, Colorado, Connecticut, Delaware, DC, Hawaii, Idaho, Illinois, Indiana, Iowa, Kansas, Kentucky, Louisiana, Maryland, Massachusetts, Michigan, Minnesota, Missouri, Montana, Nebraska, Nevada, New Hampshire, New Jersey, New York, New York City, North Dakota, Ohio, Oklahoma, Oregon, Pennsylvania, Puerto Rico, Rhode Island, South Dakota, Texas, Utah, Vermont, Virginia, Washington, West Virginia, Wisconsin, and Wyoming. NOTE: the Fourth registration ("old man's registration") records for the following states were destroyed and are not available: Alabama, Florida, Georgia, Kentucky, Mississippi, North Carolina, South Carolina and Tennessee. This article was updated on 2 March 2018. "Where have you gone, Joe DiMaggio? Our Nation turns its lonely eyes to you..."
I'm sensing a new trend. Buddy Holly's passport was recently sold at auction. And now a sports memorabilia company has put passports for Marilyn Monroe and Joe DiMaggio up for auction. Marilyn Monroe's dates from 1954 and was issued to "Norma Jean DiMaggio known as Marilyn Monroe." 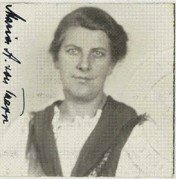 For information on obtaining passport records see the Passport Application Records section on the Finding Naturalization Records webpage. This article was updated on December 12, 2014. I drove up to Boulder this afternoon to visit Columbia Cemetery, where I met with Mary Reilly-McNellan, who is the Project Manager for Columbia Cemetery Preservation. 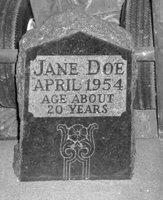 I had emailed her last week to ask if I could photograph Jane Doe's grave marker, which has been put away for safekeeping. 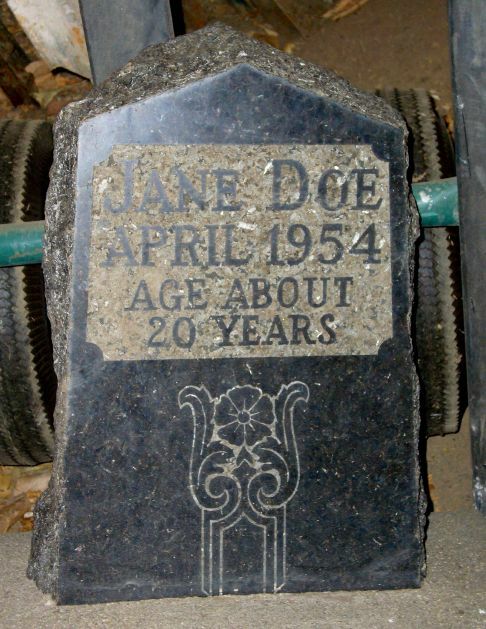 Mary showed me where Jane's grave marker was locked away and I took a couple of pictures. 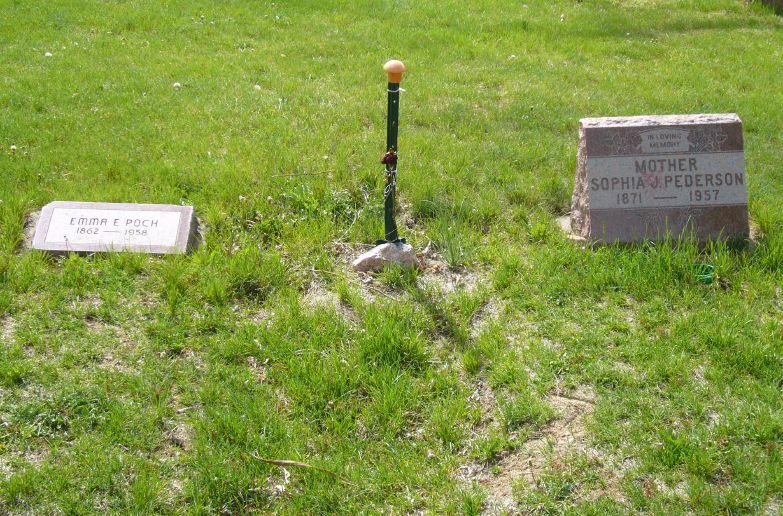 The grave marker is no longer on the grave because the cemetery's keepers are afraid of vandalism - the cemetery was badly vandalized earlier this year. And Jane Doe is well known in Boulder for being a mystery. In April 1954 a young woman's body was found by hikers in Boulder Canyon below Boulder Falls. She was thought to be between 17 and 20-years-old. Despite many leads and tips, the Boulder County Sheriff's Department was never able to identify the body or find the killer. Boulderites contributed funds to pay for a burial plot, Howe Mortuary provided a casket, and a grave marker was donated by the Boulder Marble and Granite Works. 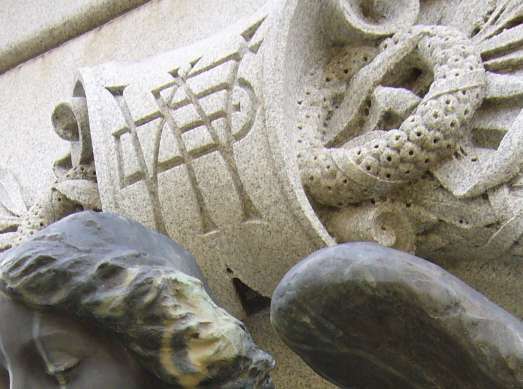 I also like deciphering and learning about the symbols that can be found on some grave markers. I have a book called Stories in Stone - A Field Guide to Cemetery Symbolism and Iconography that explains the meaning of some of these symbols. In late April I visited Denver's Fairmount Cemetery and I photographed an angel sculpture that had an unusual symbol above it. I haven't been able to determine the meaning behind this symbol. If anyone knows what it means feel free to leave a comment. Just click on the comments link right beneath this post. Thank you. Update: this symbol turned out to be a monogram with the initials FDW, which stand for Frederick Dearborn Wight (1837-1911), who is one of the family members buried in the plot. Thanks to all who contributed suggestions. For information on Titanic passenger records see the New York section at... What Passenger Lists are Online? The Wisconsin Historical Society has updated their pre-1907 vital records index to include marriage records. Birth and death records were already included. While the index covers 1852-Sept. 30, 1907, most entries date from 1880. You may find a few entries prior to 1852.